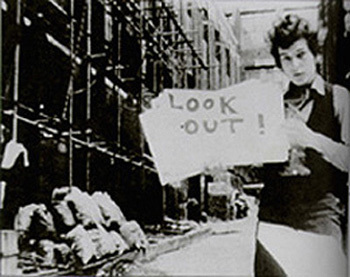 "Well there was this movie I saw one time..."
Filmed during Dylan's 1965 tour of England, Don't Look Back is a crisp cinema verite from director D.A. Pennebaker. Performances from his last all-acoustic tour are remarkable, but the highlight here is the barbed wit of behind-the-scenes Dylan. As he rips apart a journalist, you can't help but feel sorry for the poor scribbler. A young science student is also the target of Dylan's barbs, but in a more jesting manner. The famous broken glass scene shows Dylan losing his temper at someone throwing glass out of his hotel window. Watching the pissed-off Dylan is a voyeuristic experience; it seems too private a moment for the big screen. Despite the screaming mass of girls that climb all over his getaway car, Dylan is kind to two young English lasses who whistle at his hotel window, inviting them up to his room for autographs. He is also charming and polite to the High Sheriff's Lady (a position that could only exist in England) and her three sons when they come barging into his room. The combination of Pennebaker's craftsmanship and Dylan's charisma and wit make for a fine film. Though there were some detractors, it was generally well-received with critics and audiences. Filmed in 1966 as apart of a TV special that was never aired, Eat the Document was finally released in New York in 1971. The film was shot by Pennebaker and edited by Dylan, but it lacks the cinematic quality of Don't Look Back. It opens with an interesting scene in which Dylan and John Lennon share a ride in the back of a car. It's difficult to understand Dylan's slurred speech, and he seems worse for drink, but the verbal exchange between the two legends is fascinating. It's hard to find, but worth it. As evident by the title, this is director Sam Peckinpah's interpretation of the story of Billy the Kid. Dylan has a small role as Alias, a printer's apprentice who throws in his lot with the Kid, played by Kris Kristofferson. Dylan wrote the soundtrack, released as an album bearing the movie's name. "Knockin' On Heaven's Door" became one of his more famous songs after its appearance in the movie. Pat Garrett and Billy the Kid has more to commend it than Dylan's small role, but the facts surrounding the Kid are not entirely honored. Alias was a real person described by the real Pat Garrett, but the Kid was nothing like Kristofferson's brutal version. He was a slightly built youth who did not use tobacco, alcohol, swear words, or prostitutes. Surprisingly, Young Guns presents a more faithful film version of the Kid's short life. The studio edited Peckinpah's version and re-arranged the musical sequences, to the dissatisfaction of all involved. Another version was edited for TV, and some scenes of violence were removed. The director's cut has recently become available. 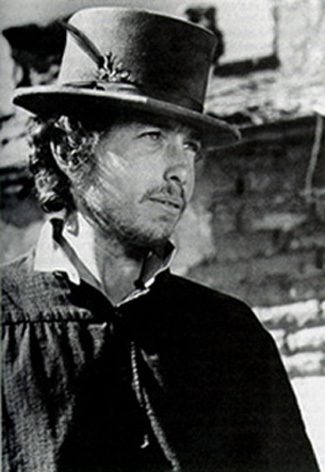 Dylan directed this four-hour movie, and the footage was shot during his Rolling Thunder Revue tour. 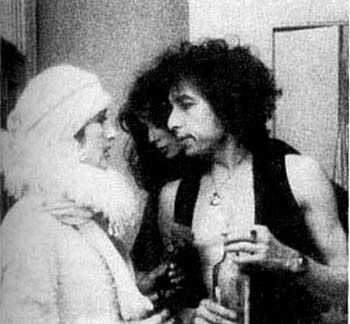 Dylan plays Renaldo and Sara Dylan plays Clara, while Ronnie Hawkins plays Bob Dylan, and Ronee Blakely, Mrs. Dylan. Joan Baez, Sam Shepard, Ramblin' Jack Elliot, Allen Ginsberg, and others of the Revue appear from time to time. The film meanders through a series of vignettes loosely based on Renaldo's quest. I found it watchable--hardly gripping, but an entertaining four hours. Renaldo and Clara did poorly in theatres, and Leonard Maltin's guide gave it no stars, not even a half-star. (Hearts of Fire also got this rating.) It's Martin Sheen's favorite film, though few seem to agree with him. Richard Marquand directed this film that, despite Dylan's starring role, ran for just seven days in London, and was never released in theatres again. Dylan plays Billy Parker, jaded ex-rock star who retires to a small town to become a chicken farmer. There he meets Fiona (Flanagan), would-be singer, brings her to England, and somehow propels her to fame. Rupert Everett plays Fiona's idol James Colt, and their affair accounts for much of the movie. Hearts of Fire resembles a low-budget made for late-night TV movie, complete with sappy love scenes and wanna-be rock star. However, there's Dylan jumping into a lake, holding up a bus driver, punching out Rupert Everett, and trashing a hotel room, as well as playing a few tunes. The plot is ridiculous but with judicious use of the fast-forward button, a fan could enjoy this flick. Dylan has a small, uncredited cameo in this film directed by Dennis Hopper. He plays a welder/artist. Jodi Foster stars as an artist trailed by the Mafia after she witnesses a hit. Hopper plays the hitman sent to bump her off, who falls in love with her instead. 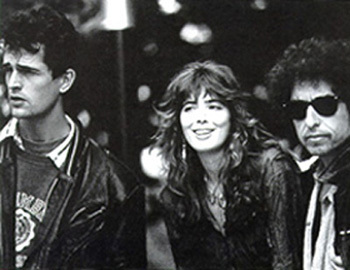 A singer (played by Dylan) whose career is going nowhere, is forced to make a comeback by playing at a benefit concert. Generally well recieved by the critics, but for me Dylan was the high point of the film.